A young boy from New Bark Town in the Johto region is setting out on his Pokémon adventure. He is asked to collect a strange egg by the local Pokémon expert, professor Elm, and gives him his very own Pokémon to take with him. The Johto region is home to 100 new Pokémon, new gym leaders, and new Pokémon attacks. 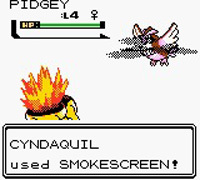 Pokémon can also hold items to assist them in or out of battle. There are also two new Pokémon Types: Steel and Dark. You can battle and trade with other players using a GB Link Cable, trade with Pokémon Red, Green & Blue using the Time Capsule, or use the GBC infra-red function to earn items for your room. 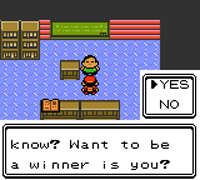 The phrase "A Winner Is You!" was a piece of bad English that originally appeared in Pro Wrestling on the NES that later became an internet meme. As in Pokémon: Red & Blue, the Game Freak headquarters can still be found in Celadon City when you reach the Kanto region. When you arrive in Pallet Town in the Kanto region, you can visit Red's house. While in the original Pokémon: Red & Blue he has a Super Famicom, Red now has a Nintendo 64.